Physician and former Foot Surgeon 1997-2012 with privileges at Florida Hospital and Orlando Health. She closed her medical practice to pursue her passion for teaching and transforming lives. She is currently an Adjunct Professor at Daytona State College (Deland campus)- Core Sciences for medical professional’s teaching courses such as Anatomy & Physiology, and Human Biology. Previously she taught, Anatomy, Body Structure and Function, Kinesiology, Microbiology, and Medical Terminology at Herzing University (Full time 2012-2015), and Adjunct at Florida College of Natural Health back in 2010 for a year. She is Founder and Owner of Serenity Now Yoga Barre & Healing Arts center in Longwood Florida since 2010. She is more than a yoga teacher, she is a lifestyle management consultant. She has combined her traditional medical training from 1991-2012, years of Gymnastics coaching, along with becoming expertise in Gait Analysis, Posture Assessments, Movement Science, Yoga Training for Kids, Prenatal, Private, Vinyasa, Hatha and Kundalini Yoga. She has always also been interested in taking courses for Energy Medicine getting certified in Advanced Pranic Healing and becoming a Reiki Master/Teacher Usui and Holy Fire Reiki. This is what she offers in terms of knowledge and applications as total wellness package she calls Medical Yoga. Dr. Milescu has a B.A. degree in Biology, a terminal degree as Doctor of Podiatric Medicine, and she later became board certified in Foot Surgery. After years of maintaining health with Pilates, she entered the realm of Yoga in 2006. She became certified in Hatha Yoga 200 hour training, and went on to Sadhana Yoga, followed by certifications in prenatal yoga, private yoga training, yoga nidra, kid’s yoga, Reiki practitioner, and an advanced certification in Pranic Healing. More recently in May 2014, she completed another 200 hour training in Kundalini Yoga. She teaches group classes while focusing on her clientele for private sessions. Dr. Milescu began her teaching career as a former elite gymnast coaching gymnastics until 2007. She fell in love with teaching Yoga and Anatomy and managed to develop her career where she is able to promote, teach, and guide individuals in both worlds with regards to health science. She has been teaching group classes and private yoga sessions since 2007. She has a clientele that is catered to specific private sessions that focus on personal health and wellness. This includes guided meditation, guided visualization, emotional freedom technique, and affirmations, in additional to traditional Yoga. Dr. Milescu is currently available for consults, and therefore will integrate her knowledge in western medicine and western herbalism. She is a practitioner of Aromatherapy, Herbal Medicine, and Crystal Healing in the ancient ways of European Holistic Healing. This integrates well with her training in Energy Medicine via Reiki and Advanced Pranic Healing. 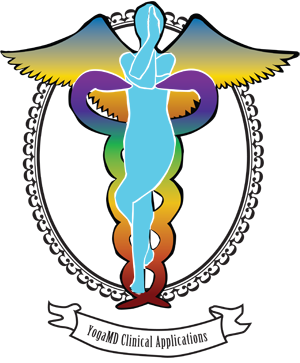 She supports Esoteric Healing practices that work well with traditional medicine. In conclusion she has come up with an all-inclusive integrated holistic wellness private practice clientele who wish to seek integrated medicine. Medical Yoga is not the same as medical yoga therapy, although both are therapeutic, the program is not designed to replace physical therapy or psychotherapy. It is not considered Yoga Therapy or Physical Therapy. It is a separate yoga practice designed as corrective posture exercises, gentle yoga asanas, assisted stretching, breath work, tapping energy centers with affirmations, energy medicine healing, and other holistic practices addressing body, mind, and soul. What is Medical Yoga Therapy? Definition: the integration of a traditional evaluation, followed by an assessment and plan of action as to concise prescriptive custom designed therapeutic Yoga program for a patient’s particular medical, psychological, spiritual, and wellness needs. The practice plan may include traditional physical therapy modalities such as assisted stretching, Yoga, Meditation, as well as Eastern Energy Medicine via implementation of Chakras, Meridians and Reiki Energy Healing. Additionally, tapping Meridians in conjunction with Affirmations, and Holistic Dietary Changes will allow transformation of physical, mental spiritual needs to ultimately change the lifestyle, and alter the path of existence towards a higher awareness, self-realization, and complete wellness of body mind and spirit.